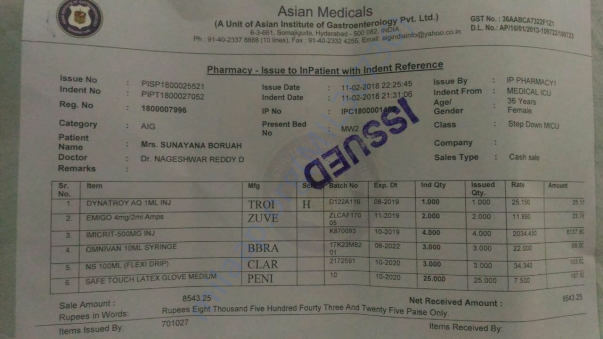 Sunayana Boruah is a mother of a seven years old child . Since December, 2017 she has been suffering from severe Pancreatitis problem. 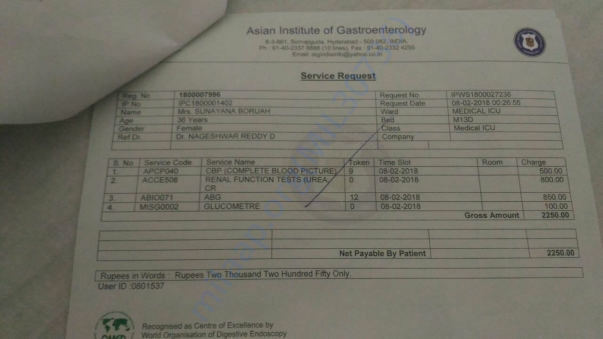 At first she was admitted at A. G. Nursing Home ( Jorhat , Assam ) under ICU supervision. 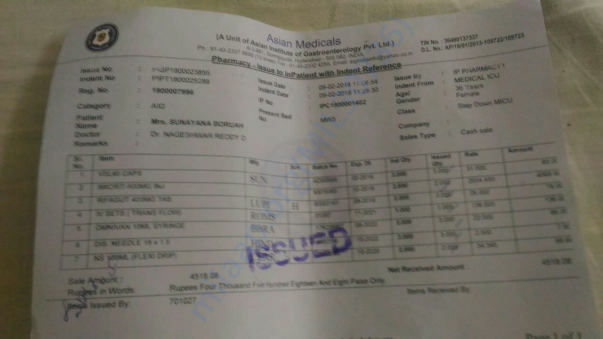 As her condition became worse day by day , she was reffered and shifted to Dispur Hospitals ( Guwahati , Assam) for better treatment. In the Dispur Hospitals also , she didn't get well after a long treatment of about a month . She was admitted in ICU at that hospital too . Her lungs were found to be filled with extra water which made her condition more critical. Basically she is a primary school teacher and she earns for her family. 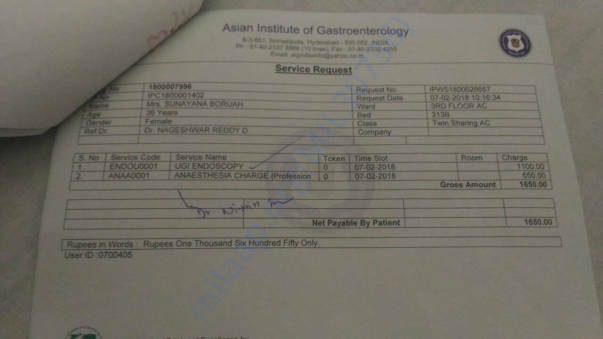 In that unfortunate condition, her family had to maintain somehow the costs of the hospitals and her medicines which was about 10 lacks . Inspite of her long treatment, she didn't show any sign to be cure . 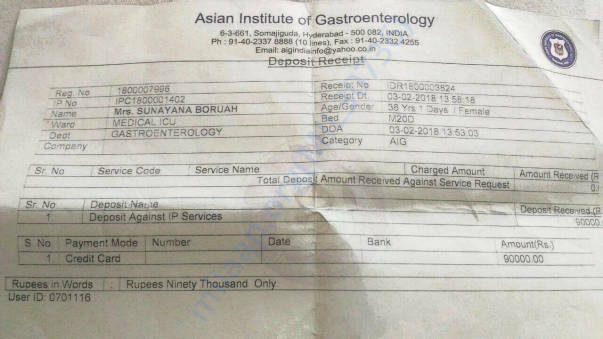 At last they decided to take her to the famous institute for Gastroenterology i.e. 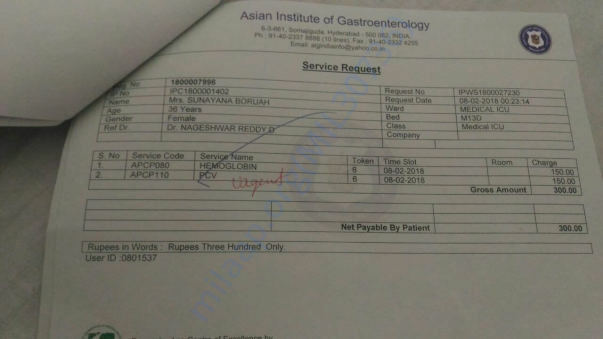 Asian Institute of Gastroenterology situated in Hyderabad. 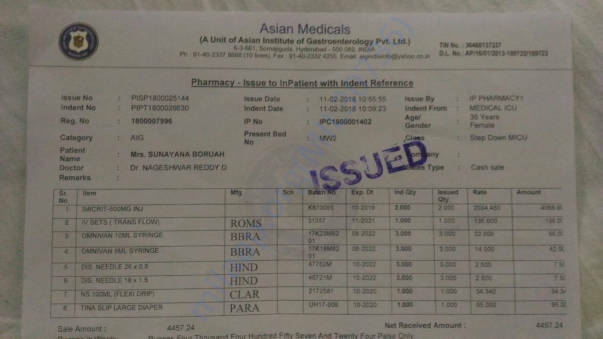 But, Sunayana's condition was so critical that she was not allowed to travel through normal airlines . 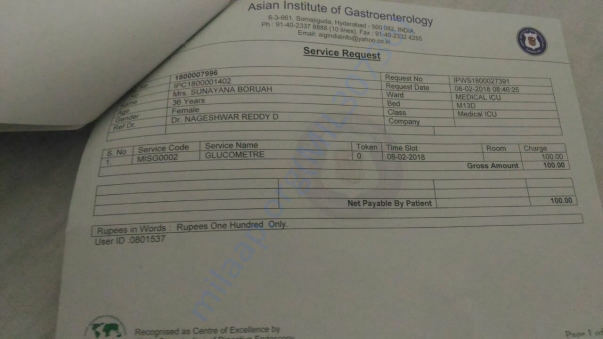 The doctors highly recomended an 'Air Ambulance' to take her Hyderabad. But the hope of the family was broken when they got to know about the cost of an Air Ambulance. It was about 9.5 lacks. 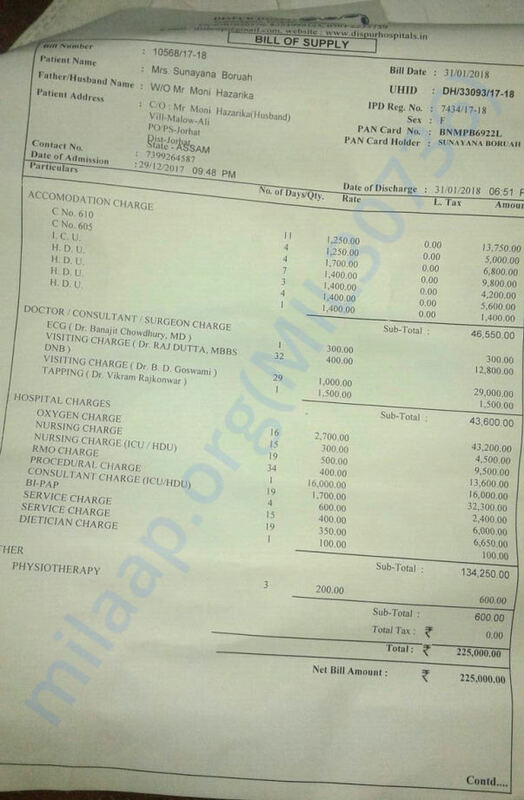 It was not possible anyhow to pay a huge amount like that without any external support. They were already spent all their savings and money they had collected from all their comfortable sources . Then they begged the Government of Assam for help . But , till now they are not receiving any kind of help from the State Government. Being failed to get support from the Government, they started to ask their friends and well-wishers for help . And then Humanity comes forward and so many people helped them as possible. 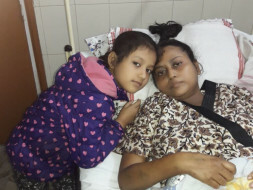 Sunayana's condition was becoming increasingly difficult but she had to wait for financial arrangements. 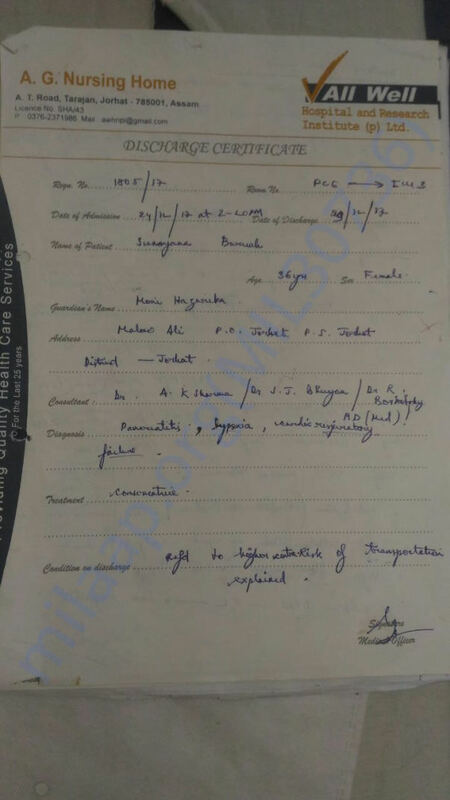 But unfortunately the arrangement could not be fulfilled completely as the amout was so big and that's why at last her family decided to take her Hyderabad by train. They had no other option . 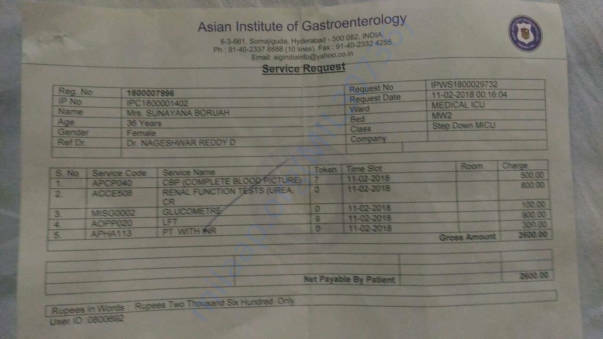 On the 3rd of February, 2018 ; Sunayana again admitted to ICU in Asian Institute of Gastroenterology in a severe condition. 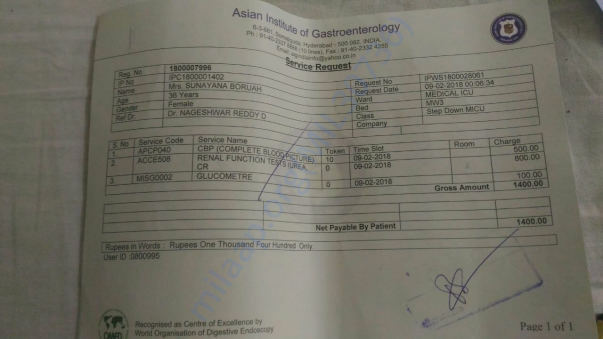 She was diagnosed to have Acute Necrotising pancreatitis with ill defined peri pancreatic fluid collections , Sepsis , Left pleural effusion , Gl bleed. Her health condition reached the worst ever as internal bleeding was started . 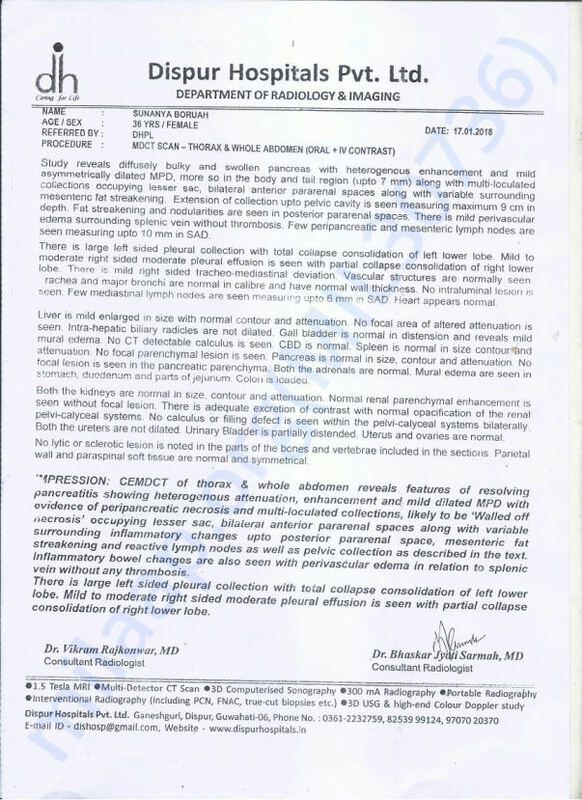 The doctors team of the institution considered that it is a very critical case . 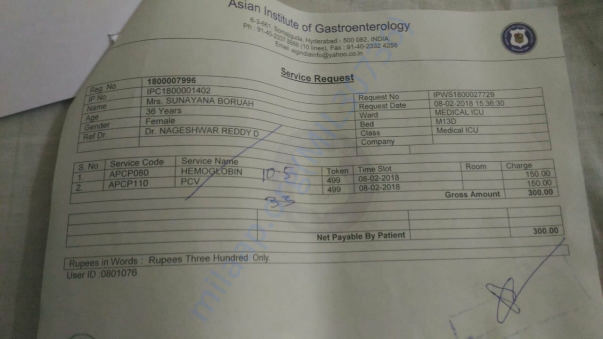 They're saying , Surgery of her pancreas is the last option to make her cure . As her family informed, her pancreas will be removed from her body by this surgery. 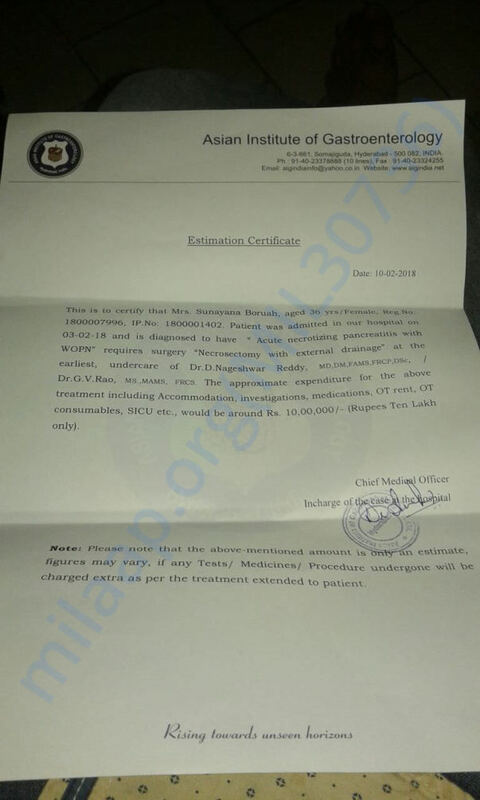 The hospital's estimate of this surgery is declared as 10 lacks ( minimum) including medicine expenditure. They have to deposit 3 lacks in advance for the surgery. Now it's our turn to make the mankind proud. If we wish we can put forward our hand of help towards Sunayana Boruah, towards a MOTHER... 'Milaap' is a way by which already more than 70+ supporters have helped Sunayana Boruah. I request you , please help her a little and be a part of humanity. Let's take Aayushi's ( Sunayana's daughter) mom back to home. Sunayana has immediately admitted in ICU in Hyderabad yesterday.